In 2018, UWinnipeg's Campus Sustainability Office (CSO) and the Richardson College for the Environment committed to working together on supporting faculty operating within sustainability-related fields. Together, the CSO and the Principal of the Richardson College, are aiming to mobilize environmental knowledge and research while creating opportunities for collaborative teaching and learning. 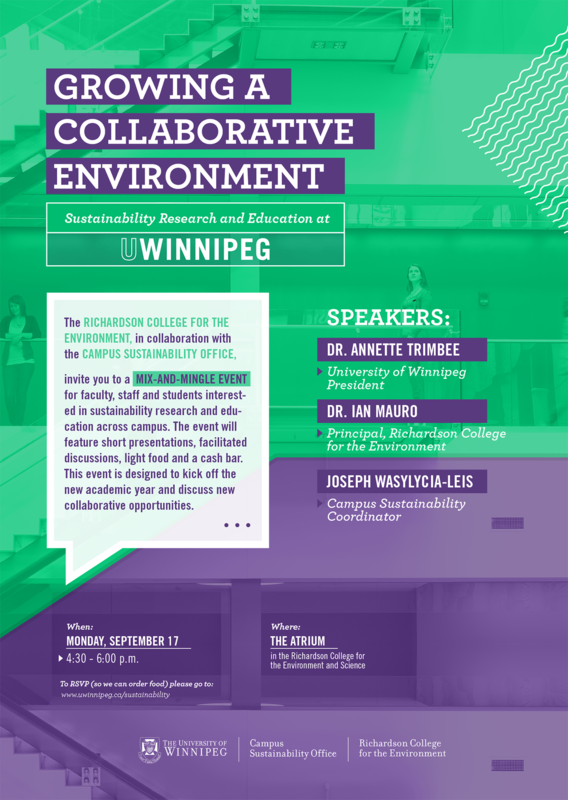 The Richardson College for the Environment, in collaboration with the Campus Sustainability Office, invite you to a mix-and-mingle event for faculty, staff and students interested in sustainability research and education across campus! The event will be held on Monday, September 17 from 4:30 to 6:00 p.m. in the Richardson Atrium. Our aim is to kick off the new school year with a conversation about how we can all collaborate to better support sustainability research and education on campus. The event will feature short presentations, facilitated discussions, light food and a cash bar.